New radio module allows broadcasters to transmit video wirelessly within their allotted spectrum, using existing equipment and without monthly fees. Persistent Systems, LLC (“Persistent”) announced today the release of its Broadcast Auxiliary Service (BAS)-Band module for the MPU5, a mobile ad hoc networking (MANET) radio that transmits and relays voice, video, text, and other IP data in a mobile, peer-to-peer fashion. “The MPU5 radio and its Wave Relay® MANET allow broadcasters and ENG engineers to use their existing equipment on a network they own with complete wireless mobility and the ability to set up their network as rapidly as the news unfolds,” said Kayla Lively, the Live Event Broadcasting and ENG Account Manager for Persistent Systems. Indeed, the release of the BAS radio module has been a highly anticipated event ever since Persistent Systems first brought the MPU5 to market in 2016. Back then, the MPU5 could be purchased with an FCC-certified 2.4 GHz ISM module, but broadcast customers wanted to operate on their dedicated licensed spectrum. 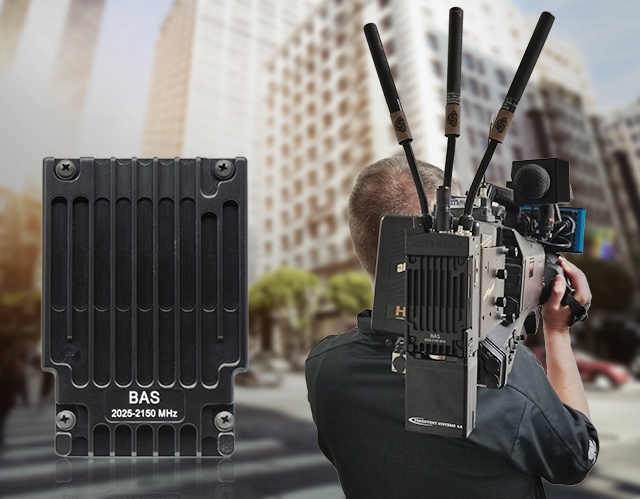 Lively noted that the new BAS module provides a huge opportunity to expand the MPU5’s presence in the broadcast sector. And Persistent Systems is already in talks with several large broadcasting groups and camera manufacturers for precisely this sort of solution. In addition, one channel of the BAS band is also licensed for Department of Defense (DoD) use in small unmanned aircraft systems, tactical targeting, and high-resolution video applications. Finally, the release of the BAS module comes right on the heels of the new Upper C-Band module, which is certified for unlicensed use in the Industrial, Scientific, and Medical (ISM) Band, enabling broadcasters to operate within additional unlicensed frequencies as needed. “We are now accepting orders for both the BAS and Upper C-Band radio modules,” Lively said.